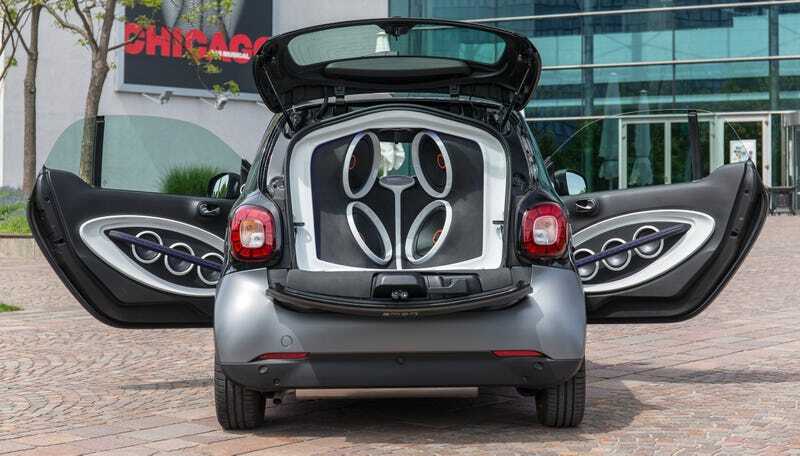 Smart is all about being compact and efficient, so when the company teamed up with audio provider JBL, it naturally wanted to see how much sound it could squeeze into one of its little hatchbacks. The resultant ‘smart forgigs,’ which boasts 5720 watts of amplification, is a mobile concert hall guaranteed to give any struggling DJ an audience. Inside this two seater small car, there are 16 loudspeakers, and two powerful subwoofers with 30 cms diameter. Powering the mid-range speakers and tweeters are three JBL GTO 804 EZ amplifiers, while powering the subwoofers are two JBL GTO 751 EZ ampliiers. Of the 16 loudspeakers, there are four type JBL GTO 609 C loudspeaker sets, wach with two mid-range speakers and two tweeters. The result of this mind blowing audio system, when at full volume, is an impressive sound pressure of up to 150 dB. To provide an unmatched concert styled experience, JBL has used digital signal processor (DSP) from Mosconi, Italian brand which is amongst the best in business. What this means, you can play music in any form of file, mp3, wav, streaming over BlueTooth, flac, cd, DVD, iOS, etc, the end result (listening experience) will be the same. Installing the audio system without compromising the smart car’s limited space took some clever engineering. Roughly 100 meters of wiring are integrated into the interior paneling, and the passenger cell is padded with plenty of extra insulation so the reverb doesn’t shake the whole thing apart. Mid-range speakers are integrated into the doors, AC vents on the dash act as loudspeakers, and subwoofers pack neatly into the luggage compartment. Please, for the love of God, wear earplugs while driving.